So you’re having a baby. You’ve got the nursery all planned out, painted, and ready to go – you just need the furniture. Specifically, you need a crib. We’ve researched and reviewed a selection of modern-style cribs to bring you the best for you baby! Our baby crib buying guide will teach you all you need to know when shopping. After, we’ve made a list of the ten best baby cribs we found. Let’s get right to the information! 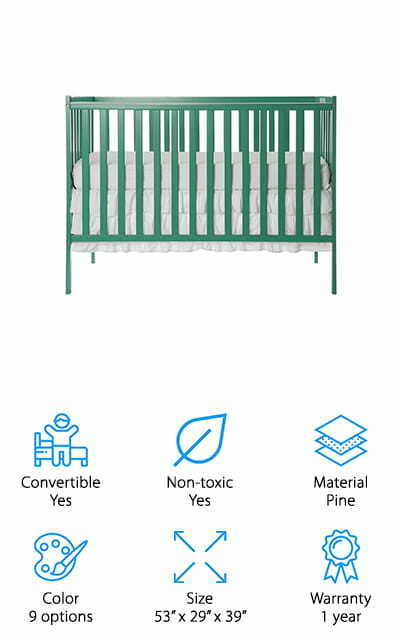 Convertible: A convertible crib will last your baby through multiple stages of life. Some have a bassinet inside for your newborn, and then they turn into a crib, a toddler bed, and even a twin-sized bed as you need them. Non-toxic: Babies chew on things. It’s just a fact. You want a crib that’s not going to hurt them to chew on. Non-toxic paint or finishes make it okay for your baby to put their mouth on the crib. Material: What is the crib made out of? Most modern baby cribs are made of wood, in varieties from pine to walnut to oak. There’s a new trend towards using more sustainable materials, such as New Zealand pine. Color: Cribs can be painted or stained in any number of colors. The most popular are dark brown (espresso), white, black, grey, or any combination of these colors. Get the color that will blend the other furniture in your nursery! Size: Get a crib that will be big enough for your baby through about two years old. A bigger size might work better in the long run, but you also need one to fit in the dimensions of your nursery. Warranty: Don’t settle for less than the best for your baby. A warranty will make sure you can the crib refunded or replaced if there’s something wrong with it. A longer warranty means you are covered for a longer time. Now that you know what to shop for, let’s get to the reviews! We’ve put together a selection of great baby cribs so you can rest easier at night. All of these products are amazing, so check out all of our baby crib reviews. If you’re in a hurry, check out our top pick and budget pick for our highest recommendations. We can’t promise they’ll be easy to put up, but we can say they’re the best! Our top pick is this Babyletto Hudson Crib. It comes in no less than eight modern color combinations in all natural shades. They’ll fit right into your nursery. The bars on this crib are round to make the crib look charming and rustic while still maintaining a modern feel. It’s made of New Zealand pine, sustainable and eco-friendly enough to make every environmentally conscious mom happy. The best part is that it converts! It starts out as a crib and can be turned into a toddler bed with rails or a daybed for when your baby gets older. The slate strength is at 135 pounds, which means that is the maximum weight no matter what type of bed is currently set up, so your child will be able to use it for years to come. There’s even a one-year warranty in case things aren’t quite right with it. 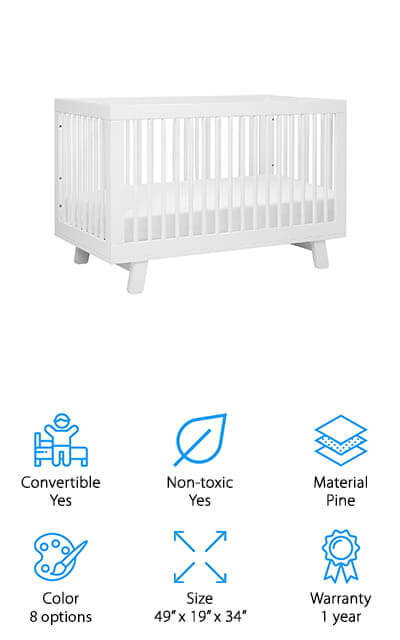 Get your baby no less than the best with this crib! 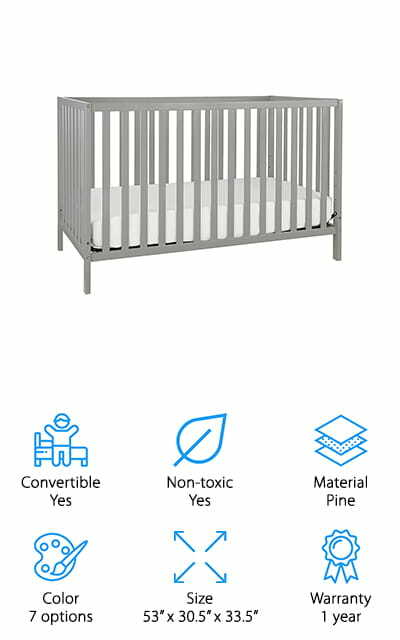 The Union Convertible Crib is the best cheap baby crib we looked at, with the best quality for your money! Is your nursery full of bright colors? Are you tired of the same old natural color selections? This is the crib for you! 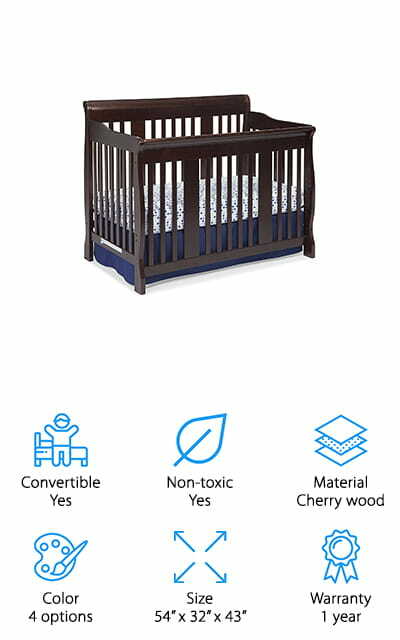 This crib comes in seven different colors, which includes the regular natural wood stains as well as emerald green, yellow, and light blue. 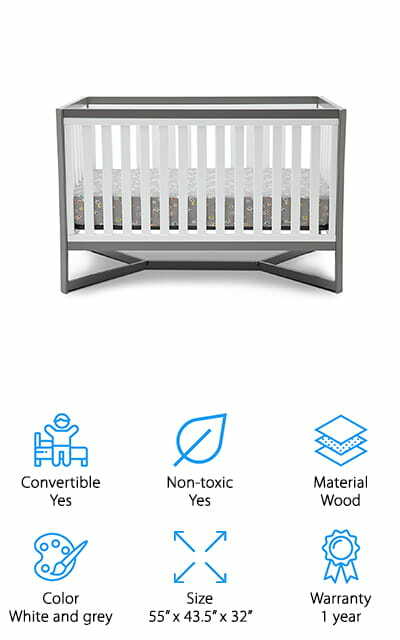 The finish on this crib is free of lead and phthalates, which makes it non-toxic. What is really neat about this crib is the four available mattress levels. You can have the mattress up to the highest setting for a newborn baby, and gradually lower it as your baby rolls, sits, and stands. And when they’re old enough for a toddler bed, buy the conversion kit to turn this crib into the perfect next step, complete with rails. Pay one price for four different bed options. It doesn’t get much better. The DaVinci Kalani is a cute little bed that is presented in a much more vintage style. The back of the crib rises higher than the front rail, making it look very much like an old refurbished crib. But it is much sturdier than a refurbished model, and it transforms into four different sleep options as well! This product comes in all the natural wood colors: from black to cherry to natural. It takes a standard crib mattress. It looks much smaller than some of the other cribs on our list, height-wise. It’s safe from all the nasty stuff you don’t want around your kid, and it’s even been screened for the presence of over 10,000 chemicals. Each product is clean! You and your baby will rest easy with this crib. But it isn’t just that – this product turns into a toddler bed and then a day bed easily. It also transforms into a full-sized bed. Wow! The Stork Craft Tuscany is a classic crib with a modern twist. It’s available in 4 natural wood color options that are free from all of the bad stuff. It’s made of pine wood, which makes it durable but also lightweight. It includes four stationary sides, so it can easily grow with your child! It starts as a crib with three mattress heights for those first stages and converts from there into a toddler bed with rails. For your child, it turns into a stylish, comfortable daybed. And when they’ve grown out of that, it transforms yet again into a full-sized bed. With this crib’s durability, you’ll never have to buy another bed for your child! We loved that there are so many matching nursery accessories with the same curves and clean lines as this crib. You’re going to want to keep it around, that’s for sure! This is one of the best of the modern baby cribs! We love the colorful options for this crib! 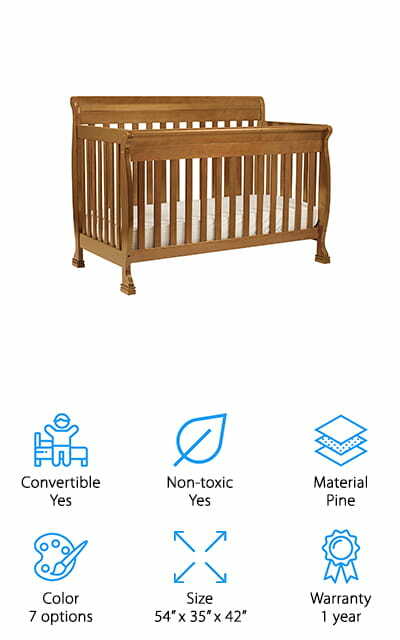 This convertible pine crib comes in all the natural colors, but also comes in blue, pink, and emerald green. This crib could really make your nursery pop! It looks like a classic crib, promoting minimalism with a modern edge. No frills or bells and whistles here – just a sound, perfect crib for your little one. There are four different mattress heights supported so you can rest easy at each stage of your baby’s development. This crib is incredibly stable and sturdy! As with most of the other beds on this list, there are four other options to convert this crib! 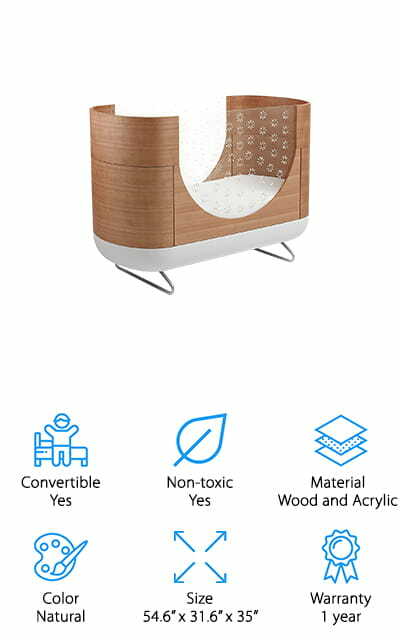 Your child will be able to use this piece of furniture until they are teenagers, at least - you will only have to buy the mattresses. We think that’s a pretty amazing deal! 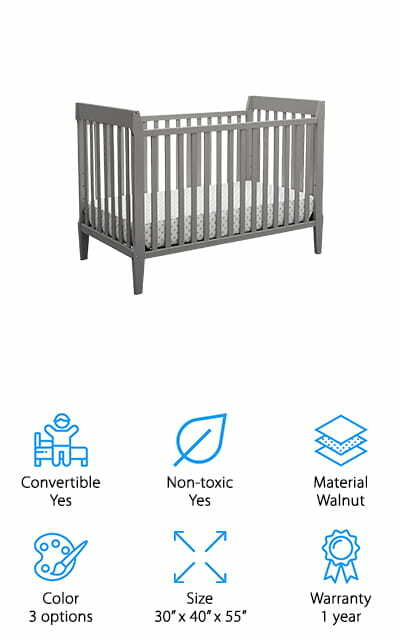 In the long term, this lightweight, well-constructed crib is an excellent investment in your child’s future. The Ameriwood Willow Lake is a Costco product, so you know it’s going to be amazing quality! This crib really stands out in the design; it comes in two color combinations, a black and white option as well as a grey and white option. These colors are simply striking. This crib will fit beautifully into any modern nursery design! And to top that off, there is so much matching furniture. You could easily afford the entire bedroom set without worry! The bed itself fits a standard crib mattress. It doesn’t convert like the other cribs on this list. It’s a simple piece of furniture with no frills or extras. We love the minimalism here! The wood construction makes it sturdy, and it’s going to need to be for the 3 mattress heights it adjusts to. This crib is functional, simple, and easy to put together. Did we mention it’s one of the best affordable baby cribs out there? The Delta Tribeca has all of the certifications you want to secure your child’s future, and it’s beautifully designed on top of that! The legs of the crib are very visibly crossed under the crib for a modern, unique look. Combined with the soft colors, this crib is going to look beautiful in any nursery! The lines are very clean and classic. We just love how it looks! As a crib, it adjusts for three different mattress positions, and from there it converts to a toddler bed and then a daybed, before its final incarnation as a full-sized bed. Your child will never be without a place to sleep! 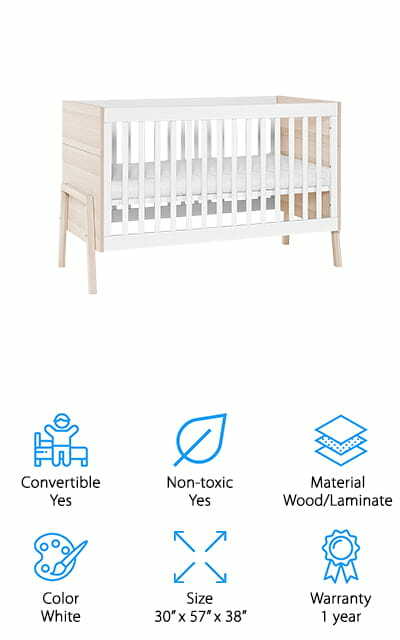 Besides the design and features, this crib is sturdy enough to ease your mind. It’s pretty solid, and did we mention how much we love the leg design? It is definitely worth the investment, especially since it will follow your child through most of his young life. Do you want a unique crib? One that will get all of your mommy friends talking? This is that crib. It’s a ‘pod’, so it strays very far from the traditional crib design. It’s definitely modern! It looks like a cocoon with its high sides. It’s a wooden crib, but it has acrylic and laser cut-out sides. This crib is so incredibly stylish, but it does not skimp on the function. It has two different mattress levels and transforms into a small toddler bed with the purchase of a conversion kit. Babies love the security of a cocoon, so your baby will love this comfy crib! It’s one of the smallest cribs on our list, and all of the features make it one of the best small baby cribs that we looked at. It is definitely modern but still has a retro feel if that’s what you’re going for. It would be perfect for a jungle-themed nursery! Coming in at the top of the lists of modern cribs is the Little Guy Comfort Crib. It looks beautiful in light-washed oak wood with white rails and accents. There is a large part of this crib that is made of laminated wood parts, which makes it easy to clean. With a little diligence, it can always look this good! There is a ton of matching furniture options as well, which is always a plus for parents who want everything to be just perfect for their baby. The frame is mostly made of varnished wood, making the crib heavy and sturdy. It wouldn’t be easy for any baby to break it! In addition to being clean, it’s easy to assemble. The parts fit together well and they are well-constructed. And like most of the other cribs on this list, this bed can convert to a toddler bed, and then a twin-sized bed when your child gets older. Serta has been a trusted name in sleep and sleep accessories. Their Mid Century Crib is no different, and it carries on the company name well. 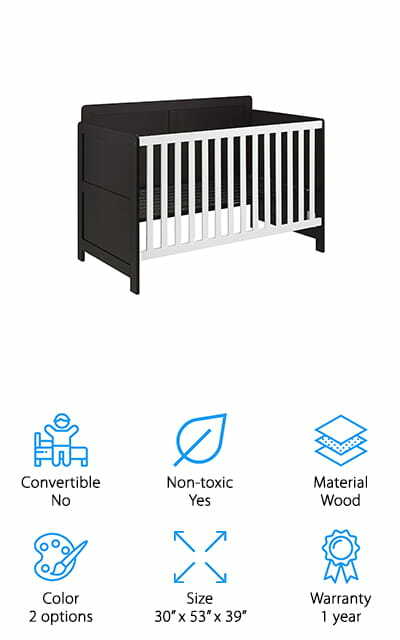 This is easily the best baby crib for sale just based on the quality of the parts and construction. This crib is small and simple. The three color options are what you would expect, natural colors. There are 4 mattress positions on the crib, so you can lower it as your child grows, and when they outgrow that mode, it can be converted for a toddler bed and a full-sized bed when they’re ready for that. It’s small and simple while still being a time-tested product with a long life. Serta calls this model “retro-modern’, which is just about correct – this crib could fit right into a living room in the 80’s and it wouldn’t look out of place. You can trust Serta to bring you and your kids the best sleep!